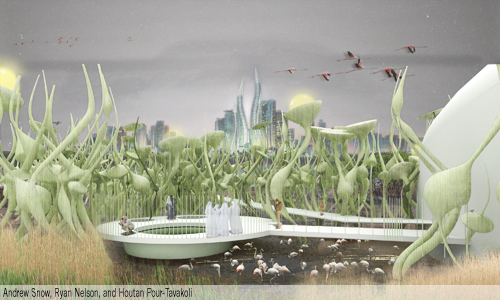 The “Hybrid Ecology” proposal presents itself as a hybrid ecosystem, blurring the line between nature and artifice. An artificial environment is created to intensify the natural landscape over time and fully integrate the Land Art competition with the existing Ras Al Khor Sanctuary. The project consists of a boardwalk meandering through a forest of super-scaled artificial plant-like objects, interspersed with sea water greenhouses that intensify the nature of the site. This obvious division between real and fake, inside and out is blurred as the artificial flora provide a great deal of very natural functions; they are the framework that supports plants started in the greenhouse, some plants act as information screens, other are bird hides, bird nests and feeding stations, and still others are equipped with solar panels that collect energy to provide glowing light throughout the night. The end result is a hybrid ecology that employs intensely artificial means to achieve a natural environment that is both familiar and alien. “Hybrid Ecology” is a piece that will change from day to night, from season to season, and year to year, thus allowing viewers to return multiple times and experience the site differently each time. Spheres resting on their plant-like pedestals will collect excess energy from solar panels throughout the day, and use it during the night, allowing them to slightly rise and pulsate with light. Also, the plants in the greenhouse will eventually mature to the point where they can be transferred outside to grow on and around the artificial plant-like forms. 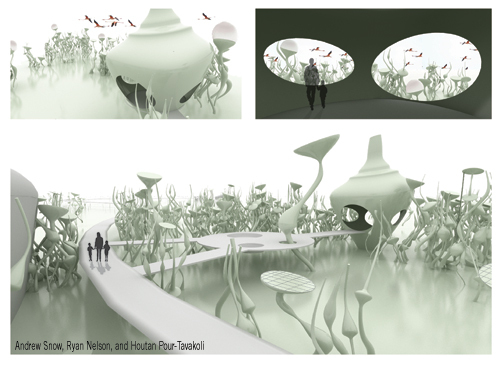 In the beginning, an ecologically alien scenario will exist but, in time, native flora and fauna will “bind” to the site, resulting in a dynamic piece that warrants multiple visits. The proposal refuses to perpetuate the excessive consumption of energy not only by local area residents, but by all of the first world. Instead of allowing this to continue with the provision of a new source of energy, it aims to prove that small-scale techniques can be used to provide energy for one’s own needs. Similarly to the recent project in Oman, Hybrid Ecology uses sea water greenhouses to aid plant growth in the extreme desert climate. The premise is fairly simple. Energy is gathered from an array of concentrated solar panels (CSP’s). The energy collected from the CSP’s gets transferred to the four sea water greenhouses (the excess energy goes to the artificial flora). This energy gets used to intake nearby sea water and condenses it into fresh water, in the process creating a micro-climate suitable for growing crops. The greenhouses have been calculated to ideally produce 6.25L of fresh water/day/m3. The waste brine from this procedure is transferred to a recycling plant where it is turned mostly into gypsum, table salt and more fresh water. The greenhouses are envisioned as a rich tapestry of densified biodiversity, full of native flora and fauna, including an animal rescue centre housed in the final structure.